By changing a single word from “support” to “success” – you can change the operational mindset of your company and how you interact with your customers. Rather than being a reactive mechanism that merely absorbs frustration, you can design a culture of proactive enablement predicated on creating ways for your customers to achieve success. By empowering your team with the social media tools, engagement techniques, content production practices, and (critically) the permission to own, and provide, authentic experiences – you’ll turn customers into successful customers – which in turn creates more advocates for your brand. 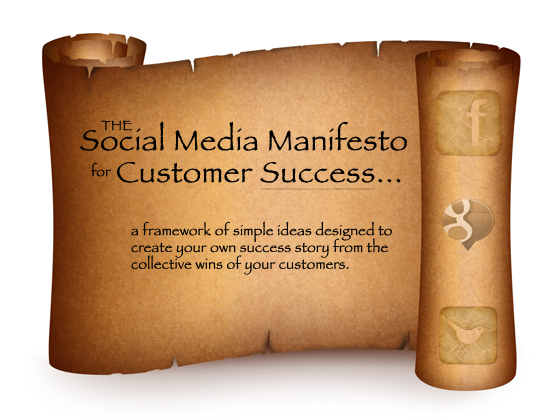 The Social Media Manifesto for Customer Success is a framework of simple ideas designed to create your own success story from the collective wins of your customers – by leveraging the power, immediacy and transparency afforded by social media communication channels. Customer success is a philosophical approach to consumer engagement with the sole intent of aiding your customers to achieve success with your product or service. Social media input channels can be used as listening posts for customer conversation to increase response times to both positive and negative discussions. This is especially critical when it comes to major issues. You should always be the first to know when something breaks. Twitter Search Tabs: Open a tabs in your browser, load Twitter and search for your brand name (e.g. “unbounce” vs “@unbounce”) – people talk about you on Twitter without knowing or desiring to use Twitter conventions. Do this for you, your competitors and related terms. Now you have a live stream of feedback to engage with the second it happens – you’ll see the number of tweets appearing in the tab title in parenthesis (x). The example below shows a search for the term “twitter” and the resulting count of current results which updates live – alerting to the level of conversation going on. News: Twitter has now implemented a drop-down menu which lets you choose from [Top/All/With Links]. Sadly it defaults to “Top” which is super lame. For a true realtime search you need to use “All”. It’s annoying to manually do this every time you want to set up your Twitter Search Tab – so to get around this you should create a URL string like this: http://twitter.com/#!/search/realtime/unbounce and replace the word “unbounce” with your search term. Slap it into your bookmarks or toolbar and you can get real-time search results instantly. Hooray! 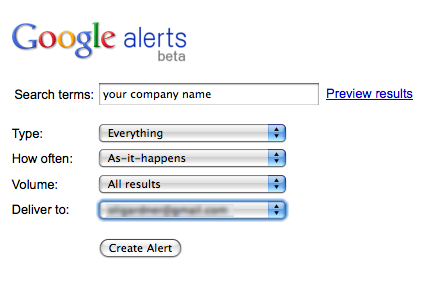 Google Alerts: Similarly, set up Google Alerts on important branded, competitive and related terms to receive alerts when you get written or talked about. TIP: when setting up the alert – choose the “as-it-happens” option. Important status updates can be facilitated through social media channels when your primary product or service channels fail (e.g. downtime). Twitter is becoming the De facto place that people turn to when your site is down. Make sure there’s a message there waiting for them. Encouraging all employees to create a Twitter presence extends your reach. It also gives you a wider spectrum of time coverage – different people/roles have different hours and different workaholic (always online) tendencies. Jeckyll & Hyde bipolar profiles: It’s okay to show your human side – as it pertains to your company brand. Have work and non work elements to your profile to set expectations. Handle: If you’re setting up a fresh account for company use you can include the brand name in your handle e.g. Unbounce_Oli. That way, when you enter a conversation you won’t appear out of place. URL: Twitter allows you to provide a URL in your profile. Add the company website here, or if you are using the bipolar approach at least include an @YourCompany reference in your Twitter description (it will be turned into a link to your main company Twitter account). Description: Set expectations for what you are going to be tweeting about and include a few keywords so you can be found via Twitter search. Branded background design: Design a unique background with a sidebar that provides simple bullet point details of why your company is special. Your ultimate conversion goal is a happy and successful customer: This means maintaining contact after initial signup. When you create useful content, share it on your network (GetSatisfaction and other forums, Facebook, Twitter). Each time a customer finds something useful that helps them, you’ve achieved a micro-retention-conversion. Expose your email freely: When engaging with customers on Twitter – don’t be afraid of sharing your email. It shows openness and transparency and lets you have a conversation that might otherwise be clumsy cramped into 140 characters. Set up your Twitter account to email you Direct Messages: Many people turn this off to avoid spam, then suffer from the inevitable month-late reply syndrome. Leave a breadcrumb trail to success: Public engagement creates content and can help more than one customer at a time. Create content at every point of customer pain: Over time you will spot patterns where people are hitting common roadblocks. Create and expose useful content that addresses these pain points and make it easy to find. This will result in a gradual decrease in support requests and higher levels of customer success. Turn on live chat: Use a tool like Olark on your website to provide an extra conversation mechanism (some people dislike email as they don’t know when they’ll get a reply, while others aren’t comfortable on the phone). A side benefit is the associated comfort just knowing that someone is there if needed. TIP: Put it inside your app (if you have an online produce or service) – so you can help people as they encounter usability problems. Most people only use it as a pre-conversion tool on their website. Collect praise and positive experiences to use as social proof and testimonials. This post about Twitter testimonials by Social Media Examiner is an excellent step-by-step guide. Celebrate and showcase your customer’s successes through your network (always with permission). How many of these things are you currently using to help your customers achieve success? Got any ideas I left out? Add them to the comments and if they’re good I’ll add them to the manifesto.